Sumatran Fleabane (Conyza sumatrensis) is a dicot weed in the Asteraceae family. In Paraguay this weed first evolved multiple resistance (to 3 herbicide sites of action) in 2017 and infests Soybean. Multiple resistance has evolved to herbicides in the Groups B/2, D/22, and G/9. These particular biotypes are known to have resistance to chlorimuron-ethyl, glyphosate, and paraquat and they may be cross-resistant to other herbicides in the Groups B/2, D/22, and G/9. Two articles about this case. Click on the links for the full articles. MULTIPLE RESISTANT OF SUMATRAN FLEABANE IN PARAGUAY. 2018	Albrecht, A.J.P., L.P. Albrecht, A. Pires, G. Thomazini, J.B. Lorenzetti, and M.T.Y. Danilussi. Buva Resistente A Herbicidas En El Paraguay. 2019	Albrecht, A.J.P., L.A. Pivetta, L.P. Albrecht, A. Pires, G. Thomazini, J.B. Lorenzetti, and M.T.Y. Danilussi. Greenhouse, and Laboratory trials comparing a known susceptible Sumatran Fleabane biotype with this Sumatran Fleabane biotype have been used to confirm resistance. For further information on the tests conducted please contact the local weed scientists that provided this information. There is no record of differences in fitness or competitiveness of these resistant biotypes when compared to that of normal susceptible biotypes. If you have any information pertaining to the fitness of multiple resistant Sumatran Fleabane from Paraguay please update the database. The Herbicide Resistance Action Committee, The Weed Science Society of America, and weed scientists in Paraguay have been instrumental in providing you this information. Particular thanks is given to Alfredo Junior Paiola Albrecht, Leandro Paiola Albrecht, Maikon Danilussi, and Guilherme Thomazini for providing detailed information. Fernando Machado dos Santos , Leandro Vargas , Pedro Jacob Christoffoleti , Franciele Mariani. 2013. Evaluation of horseweed (Conyza sumatrensis) resistance to glyphosate in Rio Grande do Sul – Brazil. Abstract from Doctorate Dissertation : . (Conyza bonariensisandConyza canadensis) recorded in Rio Grande do Sul State, however resistance ofConyza sumatrensisto glyphosate is registered only in Paraná State. This report has the objective of stating the presence ofConyza sumatrensisresistant to glyphosate biotypes in Rio Grande do Sul State Brazil. To support this report, researches to evaluate the occurrence of glyphosate resistance in horseweed biotypes, in Rio Grande do Sul State, and for that, seed samples were collected in soybean areas with unsatisfactory control, 25 biotypes. These biotypes were preliminary evaluated for resistance to glyphosate, applying a dose of 720 g/ha. Seeds from this first test of two selected biotypes of horseweed, which were not controlled in the first trial, with contrasting degree of susceptibility, were chosen to develop the second trial. The selected biotypes were grown after herbicide application (first trial) to seed production. It was also made, from these biotypes, herbarium specimens, which were sent to the Department of Biology of the Federal University of Santa Maria, where it was cataloged and classified by Dr. Thais Scotti Canto Dorow, plant systematic specialist, asConyza sumatrensis(Retz.) E. Walker (TELES; BORGES; HEIDEN, 2013) and subsequently deposited in the herbarium, SMDM under numbers SMDM 13950, 13951, 13952 and 13953. The biotypes selected, derived from seeds produced were evaluated by dose-response curves, using eight herbicide doses (0, 45, 90, 180, 360, 720, 1,440 and 2,880 g/ha) applied at growth stage of 3 to 4 leaves and/or 0.5 to 1.0 inch height. The experiments were conducted in a greenhouse in a completely randomized arrangement of treatments with four replications. The results indicate that the susceptible biotype to glyphosate has reduced 50 % of dry matter when used dose of 34.3 g/ha, compared with the resistant biotype, that requires 143.6 g/ha for the same control. The dose that provides 50% control of the susceptible population was 172 g/ha, compared with the resistant biotype that needs 2,028 g/ha for the same control, showing a resistance factor of 11.8..
Chiang YeongJene ; Wang ZhiPin ; Chiang MouYen. 2009. Antioxidant activity of paraquat-resistant biotype of tall fleabane (Conyza sumatrensis). Crop, Environment & Bioinformatics 6 : 209 - 219. A tall fleabane (Conyza sumatrensis) biotype resistant to paraquat was found in upland fields in Taiwan. Based on the reduction of leaf area and plant fresh weight of remaining green evaluated 7 days after paraquat application, the concentration required to achieve 50% inhibition of the resistant (R) biotype was about 16-30 times than that of the susceptible (S) one. Leaf disc assay of R- and S-biotypes, treated with paraquat at different concentrations for four hours, showed a faster accumulation of malondialdehyde (MDA) in S-biotype than in R-biotype after exposed to paraquat. The content of ascorbate was higher in R-biotype, but glutathione contents were similar in both biotypes. Observation on the levels of ascorbate and glutathione after paraquat treatment indicated that this oxidative treatment principally induced a marked reduction of ascorbate and glutathione pools in S-biotype. The MDA accumulation in S-biotype subjected to paraquat treatment could be attributed to the loss of ascorbate and glutathione. In the DPPH assay, R-biotype had higher free radical scavenging capacity than S-biotype after 25-100 µM paraquat treatments. The multiple antioxidant activity of R-biotype was evident with significant total phenol content, reducing power and ferrous ion chelating potency. The results suggested that the observed paraquat resistance may partly be attributed to the antioxidant activity..
Chiang YeongJene ; Wu YiXuan ; Chiang MouYen ; Wang ChingYuh. 2008. 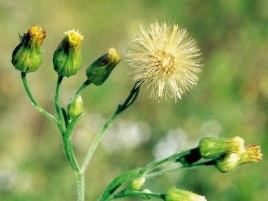 Role of antioxidative system in paraquat resistance of tall fleabane (Conyza sumatrensis). Weed Science 56 : 350 - 355. In order to explore the physiological mechanism of paraquat resistance in tall fleabane, a widespread weed in Taiwan where resistance to this herbicide has been observed since 1980, the role of the antioxidative system was assessed. The susceptible (S) and resistant (R) biotypes of tall fleabane were distinguished clearly by the relative distribution frequency of injury index caused by 78 µM paraquat. Although malondialdehyde, an indicator for peroxidation damage to the plant, in the R-biotype was not changed, in the S-biotype malondialdehyde increased within 2 h after treatment of 50 µM paraquat. Analysis of several antioxidants and pertinent enzymes revealed that ascorbate peroxidase activity was decreased by paraquat treatment in the S-biotype; and a lower basal level of ascorbate was present in the S-biotype as well. The maintenance of a high ratio of reduced glutathione to total glutathione, coupled with a pronounced and rapid increase of glutathione reductase (GR) activity in the R-biotype, suggests that an active reduced glutathione/oxidized glutathione (GSH/GSSG) cycle is critical to paraquat resistance of tall fleabane. The decisive contribution of a functional GSH/GSSG cycle to paraquat resistance through an enhancement of GR activity in this weed was further confirmed by an experiment of exogenous application of ascorbate..
Wu YiXuan ; Chiang YeongJene ; Chiang MouYen ; Wang ChingYuh. 2007. Responses of antioxidative system to increasing dosage of paraquat in resistant tall fleabane (Conyza sumatrensis (Retz.) Walker). Plant Protection Bulletin (Taipei) 49 : 229 - 243. Due to its critical role in paraquat resistance, responses of the antioxidative system to increasing dosage of this herbicide were assessed in tall fleabane, a broadleaf weed. Leaf disc assay showed that malondialdehyde (MDA) content in resistant (R)-biotype was not changed 4 h after treatment of paraquat at concentrations up to 100 µM, whereas that in susceptible (S)-biotype started to accumulate at 25 µM paraquat. Enzymatic analysis revealed that superoxide dismutase (SOD) activity in S-biotype rapidly decreased with increasing concentrations of paraquat up to 50 µM, contrary to MDA accumulation, suggesting a close relationship between the declined SOD activity and enhanced peroxidation injury in susceptible tall fleabane in response to increasing dosage of paraquat up to 100 µM. The activity of ascorbate peroxidase (APX), another antioxidative enzyme, in R-biotype was doubled by 50 µM paraquat and maintained at high level thereafter, whereas that in S-biotype was inhibited by 50% as concentration of this herbicide went higher than 25 µM. In addition, the high level of ascorbate in R-biotype treated with paraquat throughout the experiment, in contrast with a low basal level and significant reduction of this antioxidant by paraquat higher 50 µM in S-biotype, may well contribute to paraquat resistance in tall fleabane. It is also interesting to find that the functional GSH/GSSG cycle we mentioned previously is also involved in paraquat resistance of tall fleabane..
Yuan, C. I. ; Hsieh, Y. C. ; Lin, L. C. ; Chiang, M. Y.. 2006. Glyphosate-resistant broadleaf fleabane (Conyza sumatrensis): dose response and variation associated with the target enzyme (EPSPS). Plant Protection Bulletin (Taipei) 48 : 229 - 241. Glyphosate-resistant and -susceptible types were obtained from the preliminary screening of 52 populations of C. sumatrensis from orchards in Taichung county, Taiwan, where suspected resistance had been reported. Seedlings at the 6- to 8-leaf stage were sprayed with glyphosate at rates ranging from 0.05 to 1.6 kg a.i./ha. A rate-response relationship was established based on the dry weight of seedlings at 14 days after herbicide spraying. The ED50 values were 0.07 and 0.56 kg a.i./ha for the susceptible and resistant types, respectively. Susceptible plants accumulated a higher amount of shikimic acid than the resistant type under 1.0 kg glyphosate a.i./ha. At 7 days after spraying, the shikimic acid content of susceptible plants (18 µmol/g) was higher by approximately 9.5-fold than that of resistant plants. The molecular characteristics of the target enzyme 5-enolpyruvylshikimate-3-phosphate synthase (EPSPS) in C. sumatrensis were studied using reverse transcriptase-polymerase chain reaction, Escherichia coli transformation, and restriction enzymes to generate the related target enzyme. Three EPSPS cDNAs were recorded for the resistant and susceptible types. The open reading frames for EPSPS1, EEPSPS2 and EPSPS3 in the resistant and susceptible types were 1341, 1338 and 1338 bp, respectively. The EPSPS2 in the resistant and susceptible types shared 96% sequence homogeneity but varied with regard to 11 amino acids. GenBank data suggested that the variation in amino acid position at 68, 196, 416 and 428 is important in the transition from susceptibility to resistance..